I’m an author, freelance writer and editor. Known internationally for my award-winning work on Tolkien, I talk and teach internationally. I am currently preparing my next book, Tolkien’s Worlds: The Places that Inspired the Writer’s Imagination, due out from Quarto / White Lion in 2020. Tolkien and the Great War – the acclaimed and award-winning book to read if you want to know how Middle-earth began or the profoundly moving facts behind the fictionalised biopic. Tolkien at Exeter College – buy this vital, richly illustrated book on the key years. Links to my blog, Twitter and Facebook. Overview of my journalism and book reviews for the press. Details and links for my publications, talks and media appearances. Contact details for comments, questions and commissions. 23–4 April 2019: I speak to the Guardian and the Telegraph about the Tolkien Estate and the Fox Searchlight biopic Tolkien. April 2019: New cover for the HarperCollins paperback / ebook of Tolkien and the Great War. 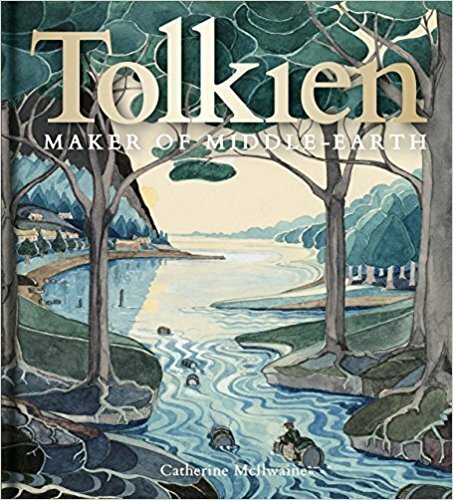 7 April 2019: Catherine McIlwaine’s sumptuously splendid Bodleian exhibition book Tolkien: Maker of Middle-earth – including my chapter on Tolkien and the Inklings – is named Best Book in the Tolkien Society Awards 2019. 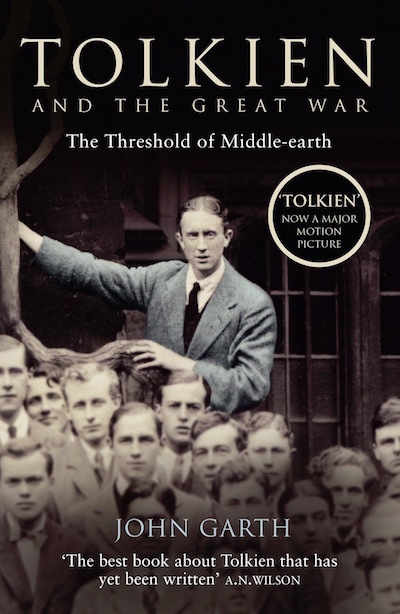 2 April 2019: Tolkien: Maker of Middle-earth is nominated for a Hugo award. 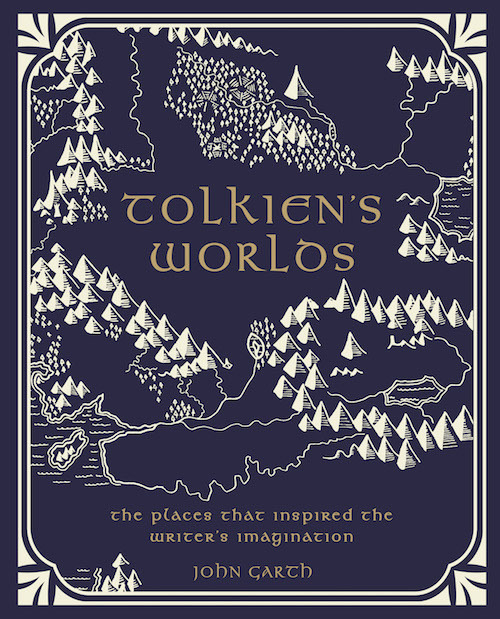 February 2020: My next book will be published – Tolkien’s Worlds: The Places that Inspired the Writer’s Imagination, from Quarto’s new imprint White Lion. 12–17 August 2019: I teach a one-week course on Tolkien and CS Lewis in Oxford for the Oxford Experience, a residential summer programme hosted by Oxford University in the grand surroundings of Christ Church. 27 April 2019: I speak on Tolkien at the Great War Forum Conference, Tally Ho Conference Centre, Birmingham. 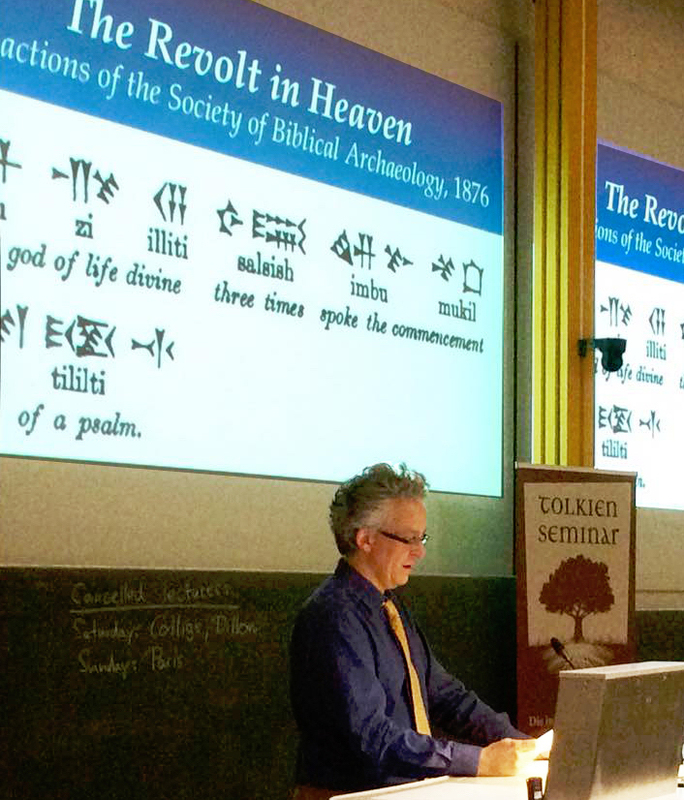 16 March 2019: I gave the keynote speech at the Morgan Library’s Tolkien Symposium in New York, accompanying the Tolkien: Maker of Middle-earth exhibition previously at Oxford’s Bodleian Library. 14 March 2019: I give my insights into the upcoming Amazon Lord of the Rings series, in the Express. 25 February 2019: ‘Ilu’s Music: The Creation of Tolkien's Creation Myth’, my investigation of the original sources and inspirations for the opening story in The Silmarillion, is published in a fabulous new collection on Tolkien and world-building, Sub-creating Arda, edited by Dimitra Fimi and Thomas Honegger and published by Walking Tree. Journalism for clients including The Times, Telegraph and Oxford University includes interviews with Oscar-winning artist Alan Lee, with features on virotherapy, insect-inspired drone design, the Ethiopian Garima Gospels and many more. Other noteworthy interviewees include Newbery-winning novelist Susan Cooper, polemicist Naomi Wolf, Pulitzer winner Siddhartha Mukherjee, Burma’s Aung San Suu Kyi; broadcaster and writer Ruby Wax, Carnegie-winning author Alan Garner, Olympic gold medallists Stephanie Cook and Andrew Triggs Hodge, and Sir Tommy Macpherson (then Britain’s most decorated living soldier). I first trained as a reporter on London papers. 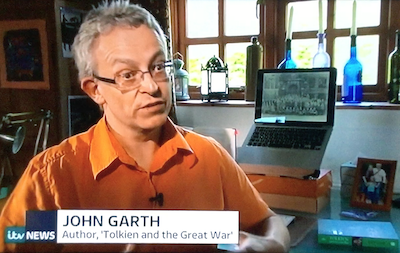 Talks and media appearances on Tolkien, the First World War and related subjects: I regularly speak to general and specialist audiences internationally and give interviews on television, radio and online. Consultancy: I acted as a consultant on BBC4’s 2016 Sleuths, Spies and Sorcerers: Andrew Marr’s Paperback Heroes, and advised on BBC2’s 2014 War of Words: Soldier-Poets of the Somme. I was historical consultant for Simon Tolkien’s novel No Man’s Land. I have assisted Oxford’s Story Museum in its developmental planning. Teaching: ◼︎︎ My one-week 2017 Oxford University summer school course on Tolkien and CS Lewis in Oxfordruns again in 2019. 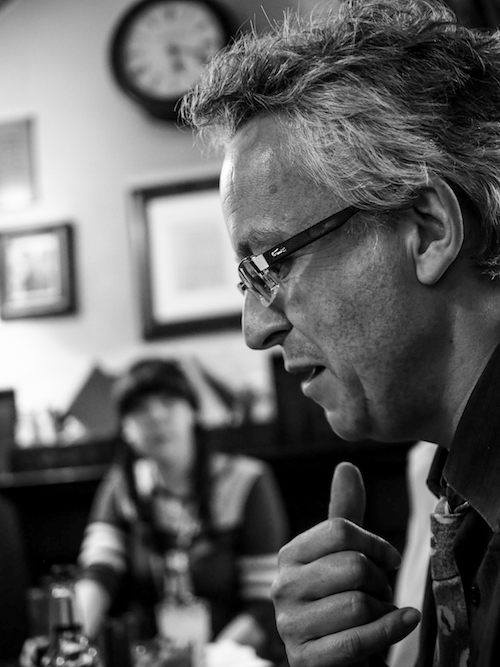 (Photo by Amy Pass, right: I read to my students at the Eagle & Child pub, the Inklings' haunt.) ◼︎︎ My 12-week course on Tolkien’s Wars and Middle-earth for students seeking MA credit with the online Mythgard Institute, ran in 2015 and 2017. ◼︎ I taught two semester-length courses for graduates and undergraduates at the University of Nevada in Las Vegas in 2016: heroic epic and Tolkien as a major British author. ◼︎ With Maria Artamonova I taught an Oxford summer school course in 2014 on Tolkien and Oxford. Book reviews have appeared in The Guardian, New Statesman, Daily Beast, Sunday Telegraph, Times, Observer, Mail On Sunday, Evening Standard, Times Literary Supplement and elsewhere, dealing with modern historical fiction, contemporary short stories, fantasy, medieval literature, literary reference, biography, and lexicography. Editorial: I’ve worked in new media, newspapers and books. I was an Evening Standard sub-editor for more than a decade, and digital editor of Oxford Today, the University magazine. I copyedited the ‘superbly compendious and entertaining’ Golden Age of Murder by Martin Edwards (now chair of the Crime Writers’ Association). Regular proofreading work has included books by Robin Hobb, Simon Tolkien, Peter V. Brett, Greg Iles, Jack Higgins, Patrick O’Brian, E.R. Eddison and Agatha Christie. Research: I’m completing a book on Tolkien’s place-inspirations, Tolkien’s Worlds, and continuing my work on a book about Tolkien in his times, begun during nine months as a visiting fellow of the Black Mountain Institute. ◼︎ Research for Tolkien and the Great War took me to Oxford’s Bodleian Library where I examined Tolkien’s personal papers; to the British Library; to the National Archives at Kew; and to the battlefields of the Somme. ◼︎ Supplementary research in college archives and elsewhere led to Tolkien at Exeter College. ◼︎ My research on one of Tolkien’s friends, an artist and junior officer killed on the first day of the Battle of the Somme, has led to a documentary film, RQ Gilson: Memoirs of an Infantry Officer, and to a play by Mike Levy commemorating Gilson’s battalion, I Regret to Inform You. ◼︎ Research on another of their circle, GH Bonner, led to the rediscovery of lost issues of the historic Hydra magazine, edited variously by Bonner and war poet Wilfred Owen. ◼︎ I researched and wrote the chronology for Agatha Christie’s The Grand Tour, about her round-the-world 1922 trip, filling gaps she left in her account. ◼︎ I have traced my family to the early 18th century, and have used genealogy extensively in other biographical research. Tolkien and the Great War, hailed on publication in 2003 as ‘the best book that has been written about Tolkien’, won the Mythopoeic Award for Scholarship. The only substantially new narrative biography of Tolkien since 1977, it is available in English, German, French, Spanish, Italian and Mandarin Chinese, and also as an audiobook in English (voiced by the author) and in German. 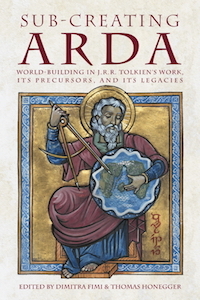 Other writings include a life of Tolkien in the Blackwell Companion to J.R.R. 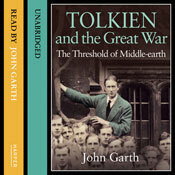 Tolkien; major scholarly papers in Routledge’s forthcoming J.R.R. 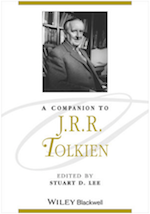 Tolkien (Critical Assessments of Major Writers); and articles in the Routledge J.R.R. Tolkien Encyclopedia, Exeter College: The First 700 years and Tolkien Studies. I’ve written and commented on Tolkien for the press in Britain and the US. I’ve also spoken live around Britain, the US and Europe; taught for the Oxford University Summer School for Adults; and been interviewed on TV, radio, DVD, in print and online. 25 January 2019: My forthcoming Quarto / White Lion book Tolkien’s Worlds: The Places that Inspired the Writer’s Imagination goes up on Amazon. 21 January 2019: Talk to University of Maryland students in Oxford. 22 January 2019: Talk on Tolkien’s creation myth, Oxford C.S. Lewis Society. 23 January 2019: Taruithorn, the Oxford Tolkien Society, gets to hear my talk on Tolkien’s Atlantis myth of Númenor. December 2018: ‘The workers return’, article on what lay in store for homecoming soldiers after the Armistice in 1918, for Unite the Union’s uniteWorks winter 2018/2019 issue. 16 November 2018: Talk at the British Library event Tolkien’s World, together with artist Alan Lee and Oxford English lecturer Mark Atherton, in celebration of Middle-earth’s Anglo-Saxon connections. 2 November 2018: ‘That was ridiculously interesting!’ One of the reactions to my talk Tolkien: From the Trenches to Middle-earth at Windsor Guildhall. 22 September 2018: Keynote talk at the Tolkien Society’s annual Oxonmoot convention, on Tolkien’s Númenor and his science-fiction ‘wager’ with CS Lewis. 18 August 2018: Opening talk for Tolkien Day at Blackwell’s bookshop, Oxford, on how Tolkien first landed in Middle-earth in 1914. 5–11 August 2018: One-week course on Tolkien and CS Lewis in Oxford for the Oxford Experience, a residential summer programme held in the grand surroundings of Christ Church. 22 June 2018: Gave a keynote paper, ‘Ilu’s Music: The creation of Tolkien’s Creation myth’ at Signum University’s Mythmoot V, at the National Conference Center in Leesburg, Virginia, USA. I was also interviewed live on stage for the Prancing Pony podcast, I gave the speech of congratulations to Signum’s new MA graduates, and I co-judged a costume contest! 5 June 2018: Publication of ‘Uncle Curro’: J.R.R. 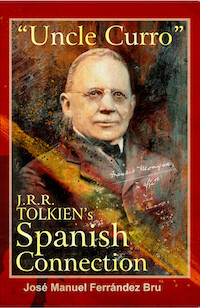 Tolkien’s Spanish Connection, by José Manuel Ferrández-Bru. I contributed the preface for this biography of Tolkien’s guardian and ‘second father’, Francis Morgan. 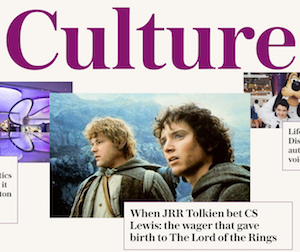 2 June 2019: ‘A once-in-a-generation event’ – I review the Bodleian Library exhibition Tolkien: Maker of Middle-Earth for the Sunday Telegraph. May 2018: My chapter on Tolkien and the Inklings appears in the Catherine McIlwaine’s Tolkien: Maker of Middle-earth, the book accompanying the major exhibition at the Bodleian Library in Oxford. 28 April 2018: Spoke at LondonMoot, a one-day literary conference on fantasy, science-fiction and fairy-tales hosted by Signum University, on Tolkien’s creation myth. 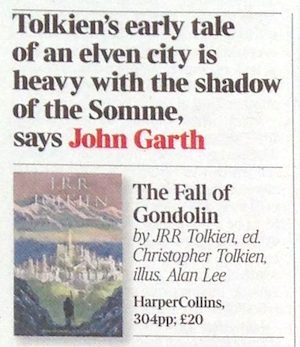 10 April 2018: I speak to the Guardian and Times as the publication of Tolkien’s The Fall of Gondolin is announced. — Oxford and Britain’s heritage sector. — Unlocking the world’s oldest mystery script. — Please touch the art. — Digging into Oxford’s past. — Why I used sheep entrails to predict the Trump era. 4 February 2018: I'm interviewed in the Sunday Telegraph as part of a property article, ‘Mapping Tolkien's real Middle-earth (better known as the West Midlands)’. Free login required. 23 November 2017: I talk to Taruithorn, the Oxford Tolkien Society, about Tolkien’s Music of the Ainur. 5 November 2017: A poem, In the Abyss. 30 October 2017: I talk about Tolkien and my research, on the Spanish Tolkien Society’s Regreso a Hobbiton podcast. Interview (in English) starts 24:37 (with slight sound problems for the first minute) and ends 63:22. 28 October 2017: I presented a new research paper, ‘Ilu’s Music: The creation of Tolkien’s Creation myth’, as keynote speaker (right) at the German Tolkien Society’s Tolkien Seminar on Literary Worldbuilding, at Augsburg University. — Oxford and the mosquito: If world health chiefs don’t listen we’ll see a new pandemic, warns top malaria expert. — Acoustic mosquito detector to aid campaign against tropical diseases. — How prehistoric humans spread malaria across the globe. —How Oxford is broadening the battlefront against tropical disease. 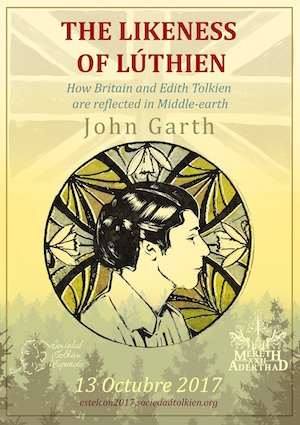 13–14 October 2017: I gave a paper, ‘The Likeness of Lúthien: How Britain and Edith Tolkien are reflected in Middle-earth’, to the Spanish Tolkien Society’s annual conference in Tortosa. — My photos of the guests in fabulous costume for the society’s annual feast at Miravet Castle are here. — At the closing ceremony I read from the end of The Lord of the Rings. 21 August 2017: Guest blog post by Peter Gilliver of the Oxford English Dictionary – Tolkien the opera composer. 6–12 August 2017: One-week course on Tolkien and CS Lewis in Oxford for the Oxford Experience, run by Oxford University. July 2017: Publication of Tolkien the Esperantist (Cafagna Editore, Italy), with a foreword by me and essays by Tolkien, Oronzo Cilli, Arden R Smith and Patrick H Wynne. 16 June 2017: Signed copies of Tolkien and the Great War help to secure funding for Lest We Forget, a mass-digitisation initiative of publicly-held material from the First World War. 11 June 2017: I’m interviewed on the Prancing Pony Podcast, a free bi-weekly programme by Tolkien enthusiasts Alan Sisto and Shawn E Marchese (60 minutes). Programme details here. 31 May to 5 June 2017: Multiple interviews about Tolkien’s Beren and Lúthien. —On television, ITV’s News at Ten (left) on 1 June 2017; Australia’s ABC News Weekend Breakfast on 4 June. —On radio, BBC Radio Oxford (segment begins at 1 hour 47 minutes) on 31 May 2017; Newstalk National Radio Ireland (last item on the show) on 1 June; BBC Radio 5 Live on 2 June, and Canadian CBC’s As It Happens (at the 21:20 mark) on 5 June. —Online, quotes from my Radio Oxford interview were used in 1 June BBC News article and reused by dozens of worldwide media outlets online. 27 May 2017: ‘Here be dragons’, Telegraph Review section and online as ‘The man who brings Tolkien to life’ – I interview Oscar-winning artist Alan Lee about his work on Tolkien’s Beren and Lúthien, the Peter Jackson movies, and other highlights of his career. 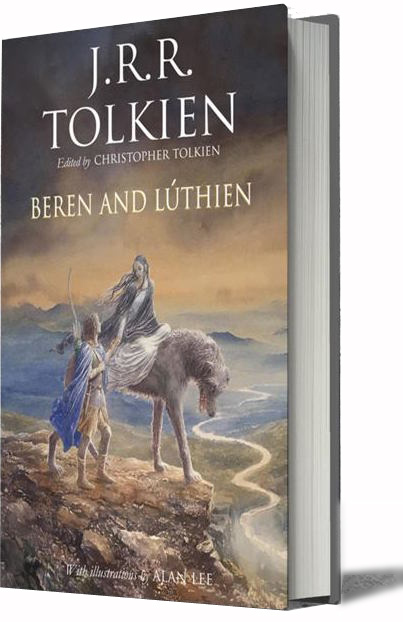 26 May 2017: Love, war and Tolkien’s lost tales – I review Beren and Lúthien in the New Statesman. 25 May 2017: Gardening the corner of a foreign field – As the Commonwealth War Graves Commission marks its centenary, I recall a 2014 visit to Flanders and northern France when I spoke to the gardeners who keep the cemeteries pristine. 23 May 2017: Catch a virus, kill a cancer: The new world of virotherapy, Oxford Today (also in the Trinity 2017 print issue, p20). 25 April 2017: I’m the winner of the Tolkien Society’s Outstanding Contribution Award. The various annual awards ‘recognise excellence in the fields of Tolkien scholarship and fandom’. 7 April 2017: Routledge’s J.R.R. Tolkien (Critical Assessments of Major Writers), a four-volume anthology for libraries, includes my ‘Postscript: One Who Dreams Alone’ from Tolkien and the Great War and my scholarly paper ‘As Under a Green Sea: Visions of War in the Dead Marshes’. April 2017: ‘The good sport: Lightweight rowing’, Oxford Today print issue, p54. April 2017: The making of the Oxford English Dictionary, interview with Peter Gilliver, author of the landmark history, published online in 24 October 2016, appears in Oxford Today print issue, p50. 31 March 2017: New blog post, When Tolkien reinvented Atlantis and Lewis went to Mars, adds a further discovery to my December article for the Telegraph – this time, especially relevant to Lewis readers. 25–26 March 2017: Talks in Oslo at ArtheCon, annual convention of Arthedain, the Tolkien Society of Norway, about the revenant dead of The Lord of the Rings and the invention of Númenor. 24 February 2017: Visions of paradise reveal unknown vistas of history, Oxford Today (also in the Trinity 2017 print issue, p19). 8 February 2017: The drone inspired by a dragonfly, Oxford Today (also in the Trinity 2017 print issue, p17). 17 January 2017: Atlantis and Mars: New Light on Tolkien, Lewis, and their Science-Fiction Pact – talk to the Oxford CS Lewis Society. January–June 2017: Digital editor of Oxford Today: The University Magazine. 8 December 2016: Nearly 75,000 people read my Telegraph online feature on the origin of Tolkien’s story of Númenor in a historic wager with CS Lewis (left, free registration required). Also a double-page Sunday Telegraph spread on 11 December. 8 December 2016: In Ely, Cambridgeshire, I read from the letters of Tolkien's friend Rob Gilson in a commemoration of his battalion. The letters and my research also featured in a play, I Regret to Inform You, by Mike Levy, conveying the experience of soldiers and their loved ones. The event was followed by a commemorative publication about the 11th Suffolk Battalion, Sons of Cambridgeshire, by Gordon Phillips and Nicky Stockman. 16 November 2016: My review of Tolkien’s The Lay of Aotrou and Itroun is published at Telegraph online (free registration required), having appeared in the newspaper’s Saturday Review on 12 November. 11 November 2016: I revealed my latest discoveries about ‘The Great Wave: Tolkien’s Atlantis myth, the 1930s crisis of civilisation, and the bridge to The Lord of the Rings’ as part of a great line-up at Tolkien Day, hosted by Liverpool Hope University. 24 October 2016: BBC4 screened ‘Fantasy’, an episode of Sleuths, Spies and Sorcerers: Andrew Marr’s Paperback Heroes on which I acted as consultant. 19 October 2016: New blog post on Tolkien’s Beren and Lúthien, a centenary publication. 1 October 2016: Teaching Tolkien in Nevada: Former OT digital editor John Garth on his move to Las Vegas – article for Oxford Today about my year as Fellow of the Black Mountain Institute. 3 September 2016: Double-length talk, ‘Revenants: How the ghosts of World War One returned to haunt The Lord of the Rings’, at the annual conference of Seryn Ennor, the Swiss Tolkien Society, hosted by the Greisinger Museum in Jenins. 25 July 2016: Talk on Tolkien, writing and publication, to the Henderson Writers’ Group, Las Vegas. 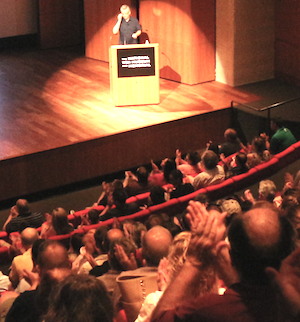 16 July: Great turnout for my talk on Tolkien’s ghosts, right, followed by book signing, at the National World War 1 museum, Kansas City, Missouri (picture courtesy of the museum). 11 July to 12 August 2016: 25-session graduate/undergraduate course on Tolkien and Heroic Epic, University of Nevada in Las Vegas. 3 July 2016: Repeat BBC4 showing for War of Words: Soldier-Poets of the Somme to mark the centenary of the battle. 2 June 2016: In consultation with me, the German Tolkien Society launches a series of online posts on Tolkien in the Great War (in German as Tolkien im Ersten Weltkrieg) charting key dates in his Somme experience. 13 May 2016: French website Tolkiendil showcases my work, including links, reviews, and the film Tolkien’s Great War with French subtitles. 11 May 2016: New blog post discussing a superb documentary on which I help tell the story of Tolkien’s TCBS friend Robert Quilter Gilson (right) up to his death in the Battle of the Somme. Commissioned by King Edward’s School in Birmingham, it is closely based on my work with his letters. 15 April 2016: In the New Statesman I review A Secret Vice: Tolkien on Invented Languages, edited by Dimitra Fimi and Andrew Higgins. 19 April 2016: My blog post ‘Tolkien’s “immortal four” meet for the last time’ is named Best Article in the Tolkien Society Awards 2016 – the second time in three years that one of my pieces has won this award. You can read the 2014 winner here. Spanish versions of the two pieces are here and here; a Portuguese version of the more recent piece is here. April 2016: I review Grevel Lindop’s biography Charles Williams: The Third Inkling for Oxford Today. 16 February 2016: Tolkien talk and discussion, at the fabulous Writer’s Block bookshop, Fremont Street, Las Vegas. 21 January to 12 May 2016: Course for undergraduates on Tolkien as British Literature, in 17 double-length sessions at the University of Nevada in Las Vegas. 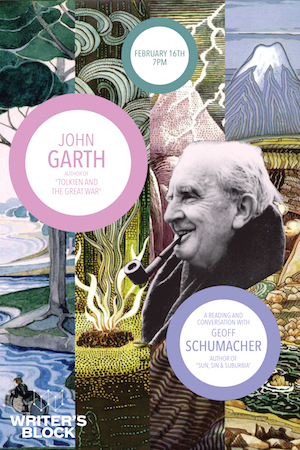 31 December 2015: ‘A must-have for anyone seriously interested in Tolkien’s life and work is John Garth’s Tolkien at Exeter College. Garth, who wrote the ground-breaking study Tolkien and the Great War, has extended his research to Tolkien’s time as an undergraduate, with new discoveries and insights (and photographs). This new, short book is an excellent complement to the longer study, and deepens our understanding of the origins of Tolkien’s lifelong work on The Silmarillion.’ —Holly Ordway, ‘The Best Books I Read in 2015’, Catholic World Report. 18 December 2015: Publication of Tolkien l’esperantista (‘Tolkien the Esperantist’, Cafagna Editore, Italy), with essays by Tolkien, Oronzo Cilli, Arden R Smith and Patrick H Wynne, and a preface by me. December 2015: Longform interview on Tolkien in German-language journal of fantastic literature Quarber Merkur. 17 November: I talk about my research as Fellow in Humanistic Studies at the Beverly Rogers, Carol C Harter Black Mountain Institute, as part of International Education Week at the University of Nevada in Las Vegas. 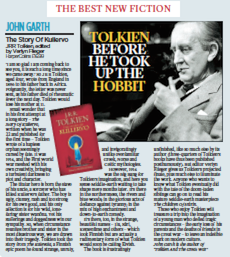 6 September 2015: My review of Tolkien’s Story of Kullervo (right) appears in the Mail on Sunday. 27 August 2015: I speak to BBC News about The Story of Kullervo, and Tolkien’s fascination with Finnish language and lore. August–November 2015: I teach a 24-session online course for the Mythgard Institute, on Tolkien’s Wars and Middle-earth, heralded by a Q&A. 17 August 2015: I take up my position as Fellow in Humanistic Studies for 2015-16 at the Beverly Rogers, Carol C Harter Black Mountain Institute, the University of Nevada in Las Vegas. 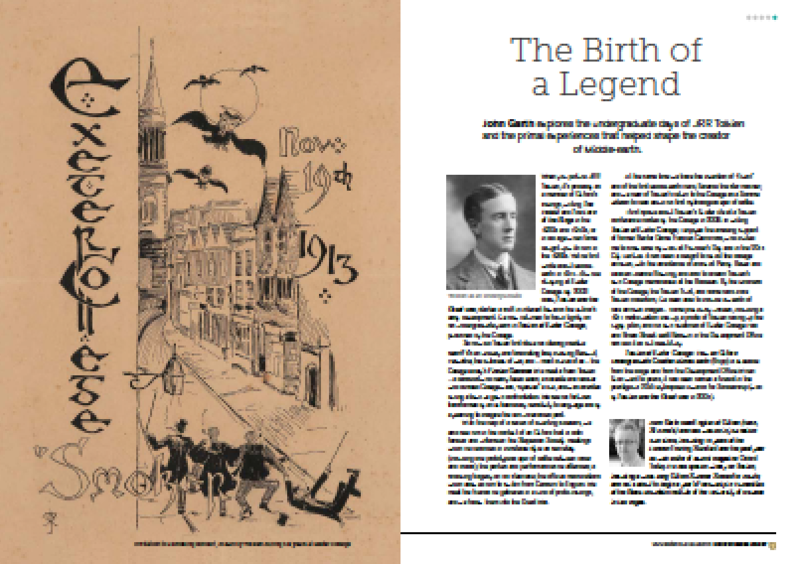 13 August 2015: ‘The birth of a legend’, article on Tolkien at Exeter College for the college’s Exon magazine. August 2015: Widely quoted in media ahead of publication of Tolkien’s The Story of Kullervo (ed. Verlyn Flieger). 3 July 2015: ‘“Quickened to full life by war”: A fresh look at why Tolkien fell for Faërie’ — talk at the Tolkien Society Seminar 2015, Leeds. 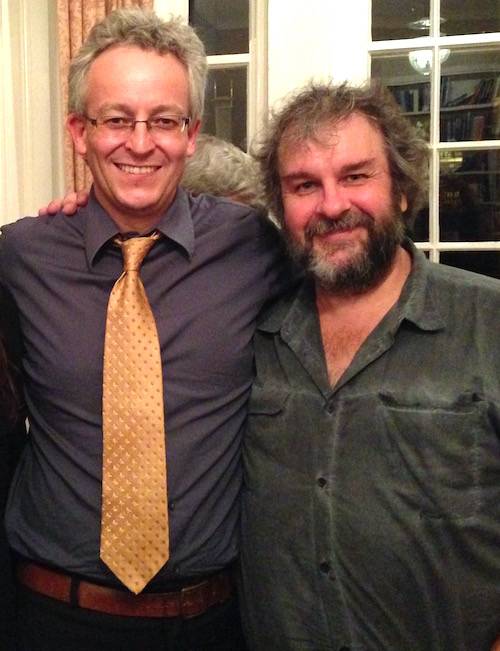 25 June: I joined Sir Peter Jackson (right) and his partner Fran on their visit to Exeter College, Oxford, and showed them highlights of the Tolkien-related archives there. 7 June 2015: I talk to the Sunday Times about the imminent book publication of Tolkien’s Story of Kullervo, predecessor to the Middle-earth tales. Also in India’s Daily News and Analysis. 30 May 2015: Tolkien at Exeter College is named a finalist for the Mythopoeic Award for Scholarship (won by Tolkien and the Great War in 2004). 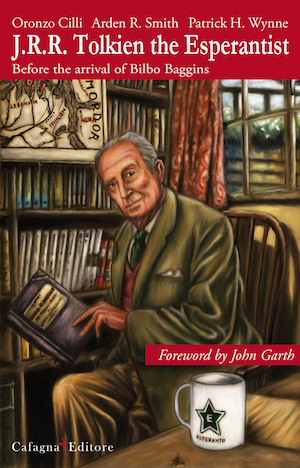 April 2015: ‘John Garth’s latest chronicle on the early life of JRR Tolkien is a very good thing indeed. Like its predecessor ... it belongs on the bookshelf of every Tolkien scholar.’ —Tolkien at Exeter College reviewed by Mike Foster in Mythlore. 9 April 2015: Tolkien talk for the Brigham Young University London Centre, LDS Church, London. 5 April 2015: Science Fiction and Fantasy Writers in the Great War, a web resource by Edward James and partly inspired by Tolkien and the Great War, wins the Best Non-Fiction prize in the 2014 British Science-Fiction Association awards. 31 March 2015: Review of Tolkien at Exeter College at Elbakin.net: ‘riche en surprises et en découvertes … une lecture à conseiller à tous les fans de Tolkien qui s’intéressent tout particulièrement à la genèse de la Terre du Milieu’. 27 March 2015: Podcast, ‘100 years on, how Tolkien came to the brink of Middle-earth’ — a recording of my paper at last November’s Merton College Tolkien in Oxford symposium. — ‘How Tolkien discovered fairy-tale through Beowulf and war’, previously presented at October’s Oxford English roundtable, published at the launch of the Sci-Fi and Fantasy Network. 25 March 2015: I talk on Tolkien and the Great War at Sam Houston State University, Texas, left, for the Tenth Annual Joan Coffey Symposium. 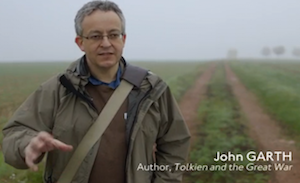 25 March 2015: For Tolkien Reading Day, on the theme of friendship, the Tolkien Society filmed me reading a deeply moving letter to Tolkien from the trenches, 1916. 20 March 2015: I’m honoured to be named Fellow in Humanistic Studies for 2015-16 at the Black Mountain Institute, the University of Nevada in Las Vegas. 16 March 2015: ‘Root and branch’, interview with the extraordinary gardener of one of Oxford’s most extraordinary college gardens. Previously appeared, slightly cut, in Oxford Today’s Michaelmas 2014 issue, 16 October. 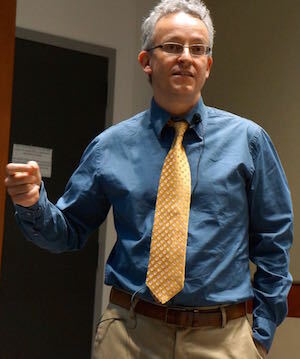 3 March 2015: Talk on Tolkien and the First World War at the Hudson Library and Historical Society, Ohio. 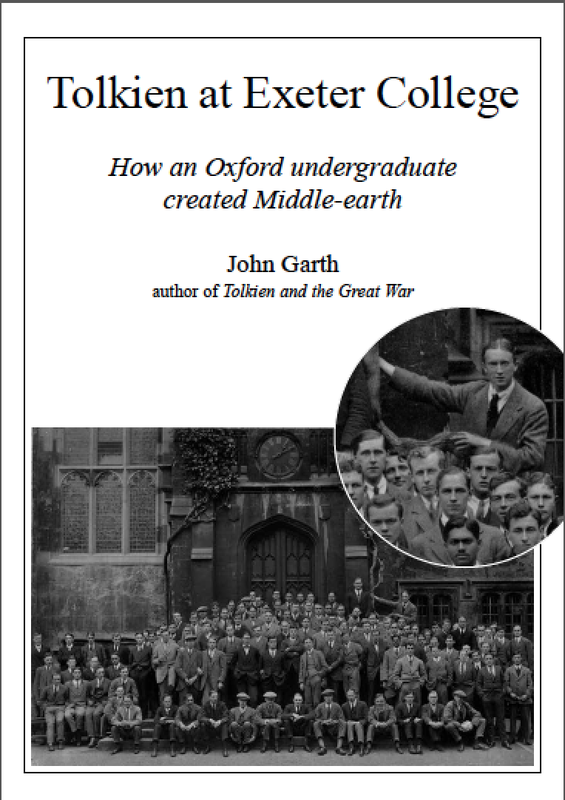 27 February 2015: Tolkien on the brink of Middle-earth 100 years ago: I talk at Regent’s Park College, Oxford. 21 February 2015: My work on Tolkien is the focus of a blog post by Dr Anna Smol of Mount St Vincent University, Nova Scotia. With videos: my Oxonmoot 2014 talk and Tolkien’s Great War. 20 February 2015: Rites of passage: student experiences abroad – singing at the Sorbonne, particle physics at CERN . . . and building loos in Cambodia. Oxford Today. Also at Oxford University’s Annual Review. 18 January 2015: Dragon scale: Why it’s impossible to size up Tolkien’s Middle-earth – blog post. Also in Portuguese. 22 December 2014: I interview Tim Severin about his famous ‘Brendan Voyage’ across the Atlantic in a replica sixth-century leather boat, and about his first adventure: retracing Marco Polo’s route to China – on a motorbike with Boris Johnson’s dad. 18 December 2014: Interviewed about ‘the trenches where Middle-earth was conceived’ in the Spanish Catholic paper Alfa y Omega. 14 December 2014: ‘Der wahre Krieg des Herrn der Ringe’ (‘The real war of The Lord of the Rings’), in Die Welt, an abridged text of my 2 November talk to a capacity crowd at the Militär Historisches Museum in Dresden. 13 December 2014: Comments in the Boston Globe on the final Hobbit movie, here and here. 9 December 2014: ‘Tolkien’s death of Smaug: American inspiration revealed’, in the Guardian and (20 December) South China Morning Post. — Comments in the Oxford Mail at the opening of the Ashmolean Museum exhibition William Blake: Apprentice and Master. 7 December 2014: Interviewed for the lead Sunday Times News Review feature, ‘The hobbit's guide to our warring world’ (subscription needed). Also at The Australian. 4 December 2014: I talk about Tolkien’s life and work in a France 5 TV special, JRR Tolkien: Le Seigneur des Ecrivains, also featuring George R.R. Martin and French Tolkien scholars Vincent Ferré, Leo Carruthers, Isabelle Pantin and others. November 2014: I appear in a splendid half-hour film, Tolkien’s Great War, made for the First World War centenary exhibition at King Edward’s School, Birmingham – the best video accompaniment to Tolkien and the Great War you’ll find right now. Also available at Tolkiendil with French subtitles. 28 November 2014: Tolkien and Oxford, article in German for TV magazine Arte. 27 November 2014: In Tolkien Studies 11, ‘The road from adaptation to invention’: How Tolkien came to the brink of Middle-earth in 1914, the in-depth exploration I only touch on in my Guardian piece. In the same issue I Tolkien’s first Elvish lexicon and major later work too (as published in Parma Eldalamberon 12 and 21). The book can be ordered here. 26 November 2014: Tolkien’s Dead Marshes, at Great War and Modern Imagination Conference, Beverley, East Yorks. 18 November 2014: I spoke on Tolkien’s 1914 creative breakthrough at Tolkien in Oxford: A Symposium, Merton College. The talk can now be heard as a podcast. 17 November 2014: Video interview for French website Tolkiendil (in English). 16 November 2014: ‘Es fällt schwer, den Enthusiasmus des Autors für sein Thema nicht zu teilen. Garth beschreibt Tolkiens Leben so facettenreich und liebevoll, dass es eine Freude ist.’ Review of Tolkien und der Erste Weltkrieg, n-tv.de. 15 November: I talk on location about Tolkien in BBC2 documentary War of Words: Soldier-Poets of the Somme, left. 15 November 2014: Live Q&A, Compiègne’s Bibliothèque Saint-Corneille, as part of exhibition, Tolkien et la Grande Guerre, le fondement d'une mythe. 11 November 2014: Talk to the Oxford CS Lewis Society on Tolkien’s 1914 creative breakthrough. 9 November 2014: I read from the letters of Robert Quilter Gilson, TCBS, as part of the centenary Remembrance Sunday events at his alma mater, Trinity College, Cambridge. 5 November 2014: ‘Fire, Fawkes and fisticuffs’, Oxford Today. 22 October 2014: I talked with four Oxford Anglo-Saxon professors in ‘Tolkien’s Beowulf: A Roundtable’, a Medieval English Research Seminar with the Faculty of English at Oxford University. The text is now online at the Sci-Fi and Fantasy Network. 17 October 2014: China’s new long march: 80 years after Mao set out, what lies ahead for a nation he would barely recognise? 10 October 2014: Talk on Tolkien to Western Front Association (Herts and Beds branch), Harpenden. 6 October 2014: ‘Recovering Hydra’, Oxford Today – how my Tolkien research led me to discover historic lost issues of a Great War magazine edited by Wilfred Owen. A fuller account appeared in September in the Wilfred Owen Association Journal, 2014 issue 2, on 17 June on my blog, and on 12 June in Oxfordshire Limited Edition (Oxford Times). 24 September 2014: In a triple whammy for the centenary of Middle-earth, I give three different considerations of the 1914 creative breakthrough that started it all — in the Guardian, in a video of my Oxonmoot talk, and at my blog (also in Italian). At Oxonmoot I was interviewed on video on this topic and others by Jay Johnstone. 12 September 2014: My 64-page illustrated book Tolkien at Exeter College: How an Oxford undergraduate created Middle-earth is published with the college. August 2014: I am now digital editor of Oxford Today: The University Magazine. 27 August 2014: Guest appearance on Son Rise Morning Show, EWTN Radio. 23 August 2014: Tolkien y la Gran Guerra is profiled in major Spanish daily paper El Mundo. 9 August 2014: I celebrate Tove Jansson, creator of the Moomins, on her centenary – at the Daily Beast. 4–8 August 2014: Articles on the First World War for UniteLive, focusing on workers who went to war, the ‘Red Clydeside’ agitation over living and working conditions, women, war and the work revolution, agricultural workers, and the changing balance of power. 2–8 August 2014: I teach a week’s course on Tolkien and Oxford with Dr Maria Artamonova for the Oxford University Summer School for Adults, exploring Tolkien the war writer and academic. 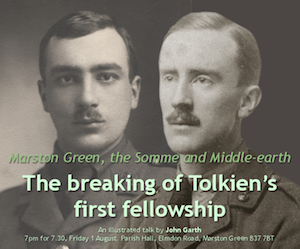 1 August 2014: Illustrated biographical talk, The Breaking of Tolkien's First Fellowship, opening a weekend of Great War commemorations in Marston Green (home of the Gilson family). 29 July 2014: ‘Why World War One Is at the heart of Lord of the Rings’, Daily Beast – for The Fellowship of the Ring’s 60th anniversary. Also available in Portuguese. 26 July 2014: I talk to a journalist about how the First World War turned Tolkien into a writer in this article in the major Brazilian newspaper Estadão. For my full comments, in English, see here. 23 July 2014: Talk on Tolkien to the University of Alabama’s Oxford summer school, Worcester College. 18–20 July 2014: Guest of honour at Tolkien Thing, the annual gathering of the German Tolkien Society, at Castle Breuberg in Hesse. 14 July 2014: Why your grandchildren may work as hard as you – or even harder. Oxford Today. 11 July 2014: I talk to a scientist whose work is inspired by the heart disease that runs in his family. Oxford Today. 1 July 2014: I review John Carey’s autobiography The Unexpected Professor, for Oxford Today. 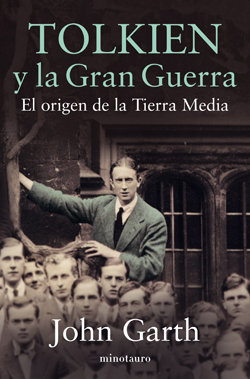 5 June: Tolkien y la Gran Guerra published in Spain by Minotauro. 29 May 2014: My review of Tolkien’s Beowulf: A Translation and Commentary, together with ‘Sellic Spell’, in the New Statesman. 28 May 2014: Spanish daily La Razón publishes a double-page feature on Tolkien y la Gran Guerra. Subscription only. 18 May 2014: I comment on Tolkien’s Beowulf in the New York Times. 15 May 2014: An exploration of Oxford’s new Story Museum. Oxford Today. 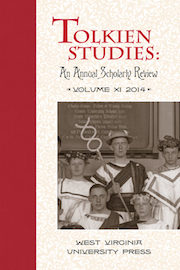 May 2014: A Companion to J.R.R. Tolkien, edited by Stuart D. Lee, published by Wiley-Blackwell, including my ‘A Brief Biography’. 30 April 2014: I give the Rector’s seminar on Tolkien, Exeter College, Oxford. 16 April 2014: I write on the explosion in migration studies, Oxford Today. 12 April 2014: Guest speaker, Tolkien Society AGM, Hay-on-Wye. My Tolkien and the boy who didn’t believe in fairies is voted best article in the inaugural Tolkien Society Awards. It’s also available in Spanish. 11 April 2014: I interview writer and comedian Ruby Wax, Oxford Today. 8 April 2014: I talk about my book and researches on the German Tolkien Society website. German and English. 6 April 2014: Founder’s Day talk on Tolkien, Exeter College, Oxford. 4 April 2014: I hear from TV historian Lucy Worsley, Arthurian author Kevin Crossley-Holland and Beatles biographer Mark Lewisohn at the Oxford Literary Festival, for Oxford Today. 31 March 2014: I talk to Australian news website The New Daily about Tolkien’s enduring appeal. 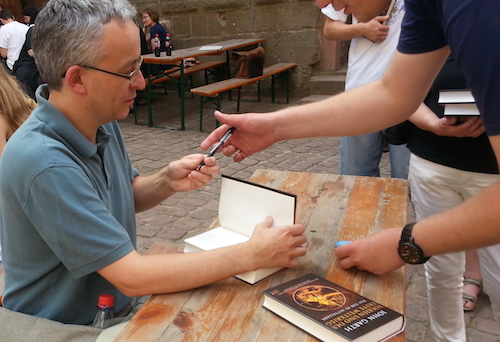 27 March 2014:I talk to major German news website Spiegel Online about Tolkien. 25 March 2014: Discussion of Tolkien und der Erste Weltkrieg on Deutschlandradio Kultur. 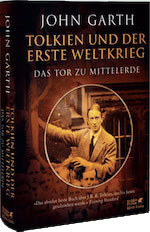 24 March 2014: Tolkien und der Erste Weltkrieg published by Klett-Cotta, with audiobook from Der Hörverlag. Here, also in German, Marcel Aubron-Bülles talks about translating the book. 22 March 2014: Bring on the monsters! My Guardian preview feature on Tolkien’s forthcoming Beowulf translation is an Editor’s Pick. 19 March 2014: Interviewed in the Guardian and Telegraph and quoted in El País on Tolkien’s Beowulf. — My review of A Strong Song Tows Us, Richard Burton’s biography of Basil Bunting, published at Oxford Today. 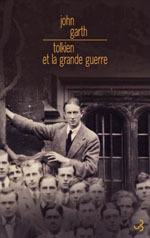 6 March: Tolkien et la Grande Guerre, left, published by Christian Bourgois; highlighted in L’Express and reviewed in La Nouvelle Quinzaine. 5 March 2014: Blog post, Tolkien at fifteen, a warrior-to-be, reveals the facts behind a newly discovered photo. Also in Italian, French and Portuguese. 27 February 2014: Somme feature in El País highlights Tolkien and the Great War. 20 February 2014: Le Monde reviews ‘le passionant essai Tolkien et la Grande Guerre’ in a (subscription-only) piece on the literary impact of the war. February 2014: Blog posts: Sam Gamgee and Tolkien’s batmen (now also in Portuguese and French) and The Tolkien brothers of Bumble Dell. — The J.R.R. Tolkien Encyclopedia: Scholarship and Critical Assessment out in paperback and ebook, with several of my contributions. 29 January 2014: Blog post, Tolkien, the Somme, and scholarship. Also in Portuguese. 26 January 2014: ‘100 years of Middle-earth’ – the debut post on my blog. Also in Portuguese at Tolkien Brasil. 6 January 2014: Review, Peter Lewis’s A Rogue’s Gallery, Oxford Today. 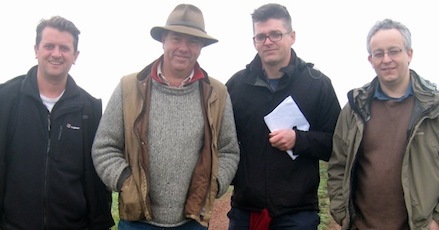 At the old front line, October 2013, with Great War researcher Jeremy Banning, historian Peter Barton and director Sebastian Barfield, filming the BBC2 documentary War of Words: Soldier-Poets of the Somme. 6 December 2013: Review, Ian Wilson’s Little Dictionary of Big Words You Should Know, for Oxford Today. 5 December 2013: Lire special issue previews Tolkien et la Grande Guerre, with extract. 3/12 December 2013: Comments on Tolkien and the First World War, as the Imperial War Museum displays his revolver. The Guardian, MailOnline and The Times. 25 November 2013: Report on the JFK anniversary talk by biographers Randall Woods and Godfrey Hodgson at Oxford’s Rothermere American Institute. 22 November 2013: Tolkien Brasil gives me a regular guest column. 20 November 2013: My appreciation of artist and friend Pauline Baynes – guest column at JJ Books. 14 November 2013: Launch of Exeter College: The First 700 Years, including my contribution on ‘The Undergraduate Tolkien’. 13 November 2013: On The Oxfordians, a new art group, for Oxford Today. 8 November 2013: Talk to the Oxford Tolkien Society on how Tolkien’s experience in the First World War shaped Frodo in The Lord of the Rings. 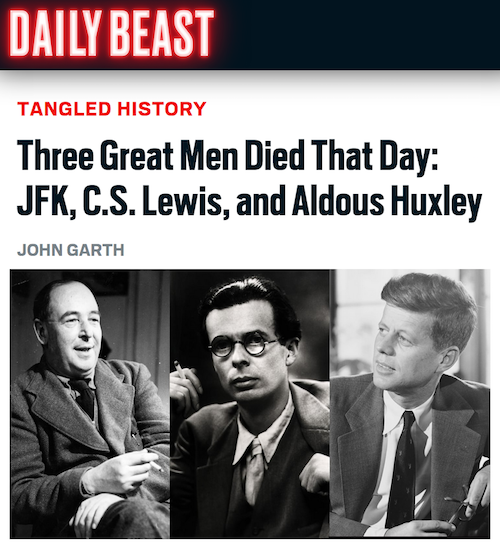 3 November 2013: Long-form feature on the coincidental deaths of JFK, CS Lewis and Aldous Huxley 50 years ago at the Daily Beast. Previously presented as a talk to the Oxford CS Lewis Society and in short form in Oxford Today. I was later interviewed on the topic by Al Jazeera English. 24 October 2013: Filmed an interview with the BBC in and near the trenches of Thiepval Wood for a 2014 documentary on writers on the Somme. 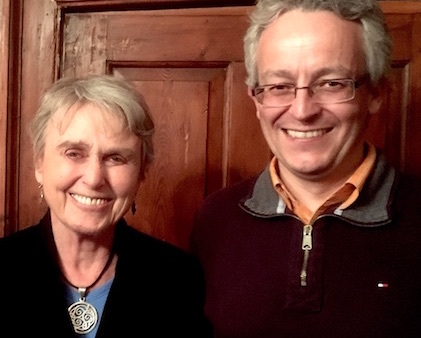 — Reviewed Alison Brackenbury’s poetry collection Then, in Oxford Today. 17 October 2013: Talk: Tolkien’s Dead Marshes, National Army Museum. 16 October 2013: joined Twitter as @JohnGarthWriter. 6 October 2013: ‘Battle of the Somme: the “animal horror” that inspired JRR Tolkien.’ In the Sunday Telegraph’s First World War supplement. 4 October 2013: I talk to the Foreign Office’s Foreign Policy Counsellor in Washington, Jennifer Cole OBE, about her time at Oxford. September 2013: My Evening Standard article ‘Tolkien fantasy was born in trenches of the Somme’ is now in Portuguese. 31 August 2013: I talk to Newbery medallist Susan Cooper (with whom I am pictured right) on her new novel Ghost Hawk, at The Daily Beast. 29 July 2013: Talk on Tolkien, British Studies at Oxford summer school, St John’s College. 29 July 2013: Interviewed by Malcolm Boyden on BBC Radio Oxford on the 59th birthday of The Fellowship of the Ring. 3 July 2013: Launched Facebook page, John Garth, writer. July 2013: Interviewed outgoing Oxford English Dictionary editor John Simpson, in Blueprint. Read here. July 2013: Review of The Broken Scythe: Death and Immortality in the Works of J.R.R. Tolkien, in Tolkien Studies 10. Read here (Project Muse subscription only). June 2013: Major feature in The Times on the Bodleian Library’s summer exhibition, Magical Books. Now also available subscription-free here. June 2013: Houghton Mifflin Harcourt Tolkien and the Great War ebook published. May 2013: Two-page review of Tolkien’s The Fall of Arthur, at The Daily Beast. Since published in French (September) and Portuguese (November). April 2013: Landmark interview with Carnegie-winning author Alan Garner in Oxford Today, plus an interview with the 2012 Turner Prize winner, Elizabeth Price. 21 March 2013: Opening talk at the Oxford Tolkien Spring School, on Tolkien’s life. March 2013: Visited the Oxford Literary Festival for Oxford Today, hearing Alister McGrath on C.S. Lewis and Lucy Hughes-Hallett on her Samuel Johnson Prize-winning biography of proto-fascist Gabriele D’Annunzio. — Reviewed Mark Atherton’s There and Back Again, on Tolkien and The Hobbit. 5 February 2013: Talk on Tolkien, Oxford C.S. Lewis Society. 25 January 2013: Reviewed Prajwal Parajuly’s The Gurkha’s Daughter, The Guardian. January 2013: Interviewed on BBC Online and ITV Meridian on Tolkien’s birthday. December 2012: Interviewed on BBC Radio Oxford’s James Cannon Show on the release of The Hobbit: An Unexpected Journey. October 2012: Nobel laureate Aung San Suu Kyi’s only print interview from her historic 2012 visit to Britain — in Oxford Today, alongside my interviews with £75million university bursary donor Michael Moritz and biographer Michael Korda. 30 September 2012: Gave a talk on Tolkien via live video feed to the National World War I Museum, Kansas City, Missouri. 19 August 2012: At the Tolkien Society’s Return of the Ring conference I spoke about Tolkien’s close friend Rob Gilson and took part in a panel discussion about research. 3 August 2012: Spoke on the BBC Radio 4 documentary Tolkien in Love about J.R.R. Tolkien’s reunion with his childhood sweetheart Edith Bratt, their marriage, and their wartime separation. 16 June 2012: Hungarian Tolkien Society conference in Budapest: talk on how the First World War shaped the portrayal of Frodo Baggins in The Lord of the Rings. Published in Hungarian in J.R.R. Tolkien: Fantázia és erköles, ed. Dr Pődör Dóra, Nagy Andrea and Füzessy Tamás. 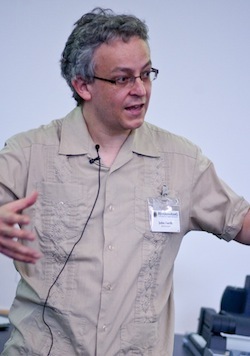 15 June 2012: Q&A with Michael Martinez of the Middle-earth and JRR Tolkien News website. For older publications and appearances, please visit the relevant pages via the navigation bar at the top of this page.